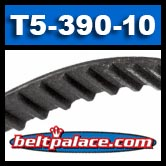 T5-390-10 Metric belt. 5mm Pitch X 390mm Length OC X 10mm Width. T5-390 Timing belt. Home > Metric Timing Belts > T5 Timing Belts. 5mm Pitch Metric Timing Belts > T5-390-10-U Metric Timing belt. BANDO Polyurethane, Fiberglass. > T5-390-10 Metric Timing belt. 10MM Wide. T5-390-10 Metric Timing belt. 10MM Wide. Neoprene. T5-390-10 Metric Timing belt. 10MM Wide. T5-390-10 Metric Timing Belt - INDUSTRIAL BRAND NEOPRENE/FIBERGLASS. SPEC: 5mm Pitch X 390mm Length OC X 10mm Width. 78 Teeth. OEM replacement industry standard Metric Belt. Popular replacement belt for electronic equipment and power tools, woodworking sanders & lathes, pump motors, and robotic equipment. Metric Belt 10-T5-390 - (Metric Standard). BANDO (Contitech) T5-390-10 (10mm W) Metric belt. Speed Control, Ametric, Bestorq, Imported T5-390-10 Metric Belt. Replacement belt for Grizzly G8690 Variable Speed Wood lathe. TIMING BELT P8690031. Belt# 993110 390-T5-10MM (or 390-5T-10). Jet 993110 TIMING BELT (390-5T-10). T5-390-10-U Metric Timing belt. BANDO Polyurethane, Fiberglass. T5-390-10-U Metric Polyurethane Timing belt. Ultra Heavy Duty BANDO INDUSTRIAL Polyurethane/Fiberglass construction.